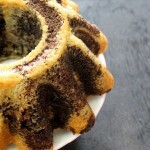 I made this Chocolate marble cake for a special reason. This cake has a combination of vanilla and chocolate and looks beautiful for any occasion. There are some people in life who make you laugh a little louder, bring a bigger smile and even a weird conversation looks meaningful. They are friends and you treasure them for life. You talk to them about anything and everything. You even end up playing dumb charades or truth and dare games and you feel sweet sixteen again 🙂 🙂 .. You feel comfortable with them and feel as if you have known them for ages. These are my friends and I love them. We usually have a monthly potluck and this time we decided to have a pizza party. Yes, we do need a break from our cooking too and just relax. I had some exciting news to share with them and wanted to share it with something sweet. So, I finally decided to bake a chocolate marble cake. You all know I’m a Vegetarian and don’t even use eggs in my cakes. I’m also allergic to eggs and always look for options to replace eggs in my recipes. This is a very soft cake and don’t need know any topping for it. You can just slice them and enjoy. I just drizzled some chocolate sauce before serving. 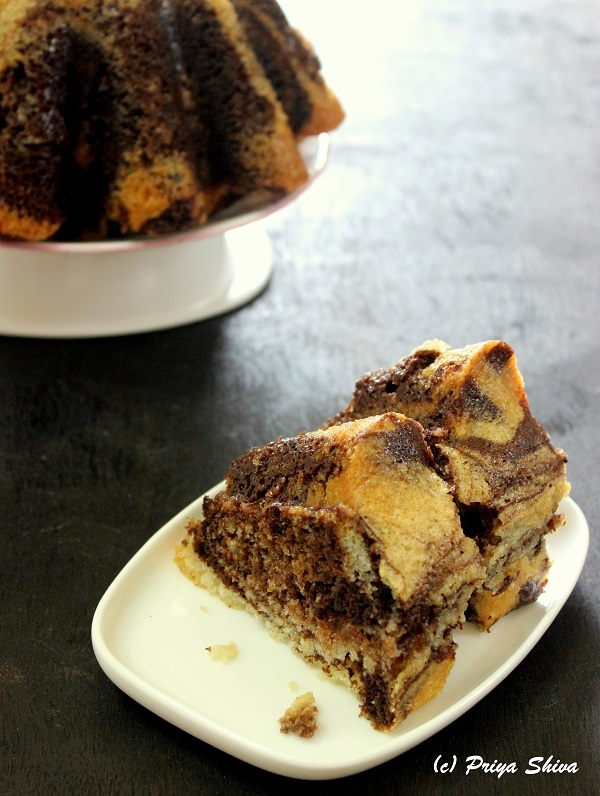 So, sharing the recipe and hope you all bake and enjoy some Eggless Vanilla Chocolate Marble Cake..Have a great week ahead! 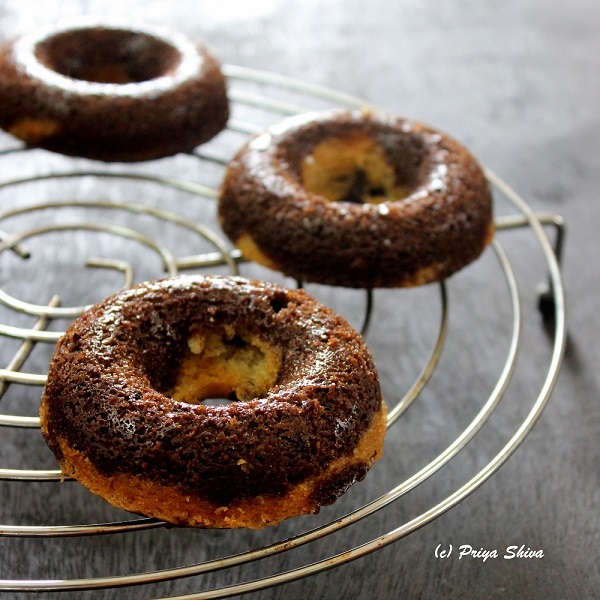 Grease the 9 inch bundt pan evenly and dust it with plain flour and tap it once to remove the excess flour. Sieve flour, baking powder and baking soda twice together and set it aside. Preheat oven to 180C /350F. In a large mixing bowl, add 1 cup hot water and sugar and blend with a mixer until the sugar partly melts. Now, add oil, curd, vanilla extract and mix well. Now start adding dry ingredients (sifted flour) slowly and mix well using a hand mixer until you get a smooth batter. Make sure there are no lumps. Divide the batter into equal 2 parts. Put in the cocoa powder and 2 tbsp hot water into one part and mix it well. Now add alternate spoonfuls of chocolate and vanilla batters in the pan. When all the batter is in the pan, using a knife, make swirling pattern through the batters to get the beautiful marble design. Bake at same temperature for 15 minutes and then lower the heat to 150C/300F and bake for 40 minutes more or until a skewer comes out clean. Remove from the oven and unmould only once it completely cools down. I have used Olive pomace oil but you can also use rice bran or canola oil. Do not keep opening the oven once you place the pan for baking or it will crack. I used 7 inch bundt pan and filled half way. What a delicious little bundt cake. I am allergic to eggs as well so always looking for recipes using replacements instead. Your cake looks so moist and delicious. Just Yummed and shared! The cake looks so scrumptious, Priya! Wow.. the cake looks awesome ! This looks beautiful. Bundt cakes are brilliant for making a cake look particularly decorative with no need for any icing. I quite life the texture of eggless cakes, but I’ve only tried making little ones, so it’s interesting the mixture can stand up to being so large. 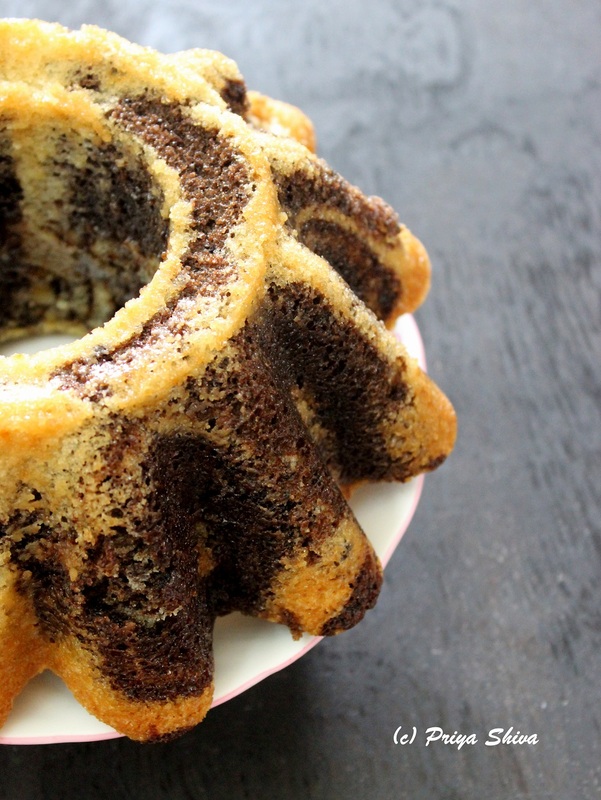 This looks so yummy and cute – Love the combination of a Bundt Marble Cake. I trued this cake yesterday..it was moist and nice..i hav just one concern…tasted a little off…the granulated sugar u mentiond..is it castor sugar or normal sugar we use..please help.. It is normal sugar we use. If you felt that it was less sweet, you can increase the amt of sugar..
Hi Priya…how are you?? The cake looks so yummy and tempting..i’m planning to bake it soon…just wanted to know if using caster sugar okay instead of normal sugar and what quantity ?? I baked it in convention microwave.. the temperature stays same.. I would suggest that you use regular sugar..
How you have made it smooth its very nice preparation.